What I Made This Week! ….Except actually, I made these last week, I’ve just been mega-busy with all kinds of other projects so I haven’t been able to show them off! After our wedding, we had a whole heap of apothecary jars left over, so I made some of them into terrariums as thank-you gifts for the people that helped us out! 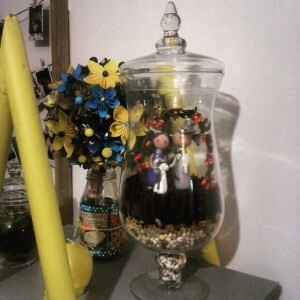 Last week we went and visited Tony’s family up north for Mother’s Day, and because we’re short on cash, I decided to make terrariums for the grandmothers. 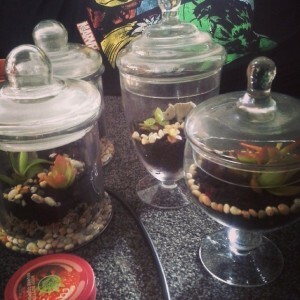 I’ve been wanting to make some for us too, to fill up the empty shelf on the bookcase (and to display the wedding cake topper I so painstakingly crafted of us and the cat) so I convinced Tony that he wanted to learn how to make terrariums. Mostly so that he could make the ones for his family, and I could make my own! 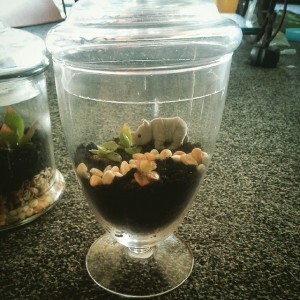 All you need are some aquarium rocks, spagnum moss, soil, and succulents, as well as a glass jar with a lid. Put the Aquarium Rocks at the bottom, then a layer of damp spagmoss, and then soil. 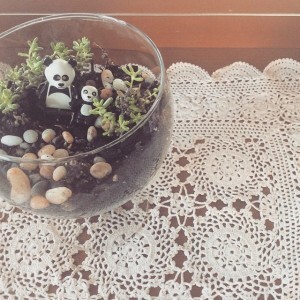 Now all you need to do is plant your succulent, and add adorable figurines (to add to the kitsch factor). Once you’ve planted, and watered it (only a little tiny bit though!) seal it up. As the moisture in the soil condenses on the lid, it will run down the sides, effectively watering the plants. You can have a terrarium that is not sealed, but you will need to water it when the soil starts to feel dry, as the moisture will escape through the top. They make really good gifts, because the recipient doesn’t have to do anything to keep them alive, which is perfect for lazy gardeners like myself who want greenery in the house.